Hot stones have been found by archaeologists across the world proving that for centuries archaic (and young) cooks have been taking advantage of the ability of rock to retain and emit heat. It is impossible to tell whether or not salt rocks were used in the past due to their nature, I feel it is unlikely, however, like ape to man or even ZX spectrum to Apple Mac, they have evolved: cooking on a salt block is nothing to shy away from, we are born to it. The properties of salt are well known and exploited in its 13,000 different uses. To help us solar power plants that have been using salt for decades because of its thermal energy storage capabilities; the storing of gas in salt caverns which highlights that the rock salt can naturally expand and contract without causing damage not to mention its impervious nature; then, of course, there is the use that everyone knows - to enhance the flavour of food. 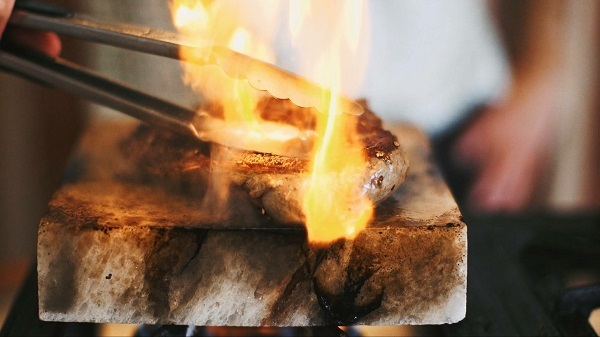 Just like hot stones, and because of its technical qualities, salt blocks have an incredible versatility and can cook anything from steaks to eggs, chicken to vegetables; but it reaches another level by enhancing the flavour simultaneously. Not only that, salt blocks can be used cold - not just as a great looking serving platter, but also to dry tomatoes for example, or add a little salt to your caramel ice cream. So heat it up and put it on the table and let everyone sizzle their own steak, chuck it on top of a chicken in the barbeque, fry your egg for breakfast on it or pickle your cucumbers: whatever tickles your fancy, just give it a go and taste the results - it is amazing. Just one thing you have to remember when you are cooking on it, it has got to be hot, hot, hot.